Lewis Hamilton must win the Mexican Grand Prix if he wants to close the points gap to Mercedes teammate and championship leader Nico Rosberg. 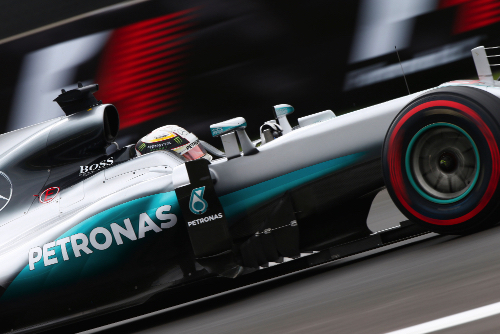 Hamilton took the first step towards that victory by qualifying on the pole ahead of Rosberg who will start second. The line-up for the weekend was: Mercedes - Lewis Hamilton and Nico Rosberg. Ferrari - Sebastian Vettel and Kimi Raikkonen. Williams Mercedes - Felipe Massa and Valtteri Bottas. Red Bull TAG Heuer - Daniel Ricciardo and Max Verstappen . Force India Mercedes - Nico Hulkenberg and Sergio Perez. Renault - Kevin Magnussen and Jolyon Palmer. Toro Rosso Ferrari - Daniil Kvyat and Carlos Sainz. Sauber Ferrari - Marcus Ericsson and Felipe Nasr. McLaren Honda - Fernando Alonso and Jenson Button. Manor Mercedes - Pascal Wehrlein and Esteban Ocon. Haas Ferrari - Romain Grosjean and Esteban Gutierrez. Palmer was missing from the 18-minute Q1. "I won't be taking part in Quali after we found a crack in the chassis. Big shame as we were 14th in FP3 and aiming for Q2 again," he tweeted. He would start at the back of the grid for the race. The top teams stayed put as the session began, and they were content to let the others get to work including Kvyat who posted the early fast time with a 1:21.454, and Sainz who subsequently did a 1:21.100. Hamilton, on the super soft Pirellis, turned a 1:19.970 eight minutes into the session, and Vettel beat that with a 1:19.865. Next, Raikkonen topped the times with a 1:19.554. Then Ricciardo jumped into second place. So, after the first runs, the order was Raikkonen, Ricciardo, Vettel, Verstappen, Hamilton and Rosberg. Then Hamilton turned a 1:19.47 to take the lead. Down at the bubble, Wehrlein was 16th, Kvyat 15th and Ericsson 17th. The latter improved to 13th, while Kvyat dropped to 18th and Wehrlein dropped out and then back into 16th. The five drivers who were eliminated at the end of FP1 were: Gutierrez, Kvyat, Nasr, Ocon and Grosjean. The fastest 16 drivers who moved on to Q2 were: Hamilton, Raikkonen, Ricciardo, Vettel, Verstappen, Rosberg, Perez, Bottas, Sainz, Massa, Alonso, Hulkenberg, Ericsson, Magnussen, Button and Wehrlein. First out in the 15-minute Q2 was Hamilton. He had the soft compound Pirellis fitted to his Mercedes. Rosberg, Vettel and Raikkonen were also on the soft tires. The idea was to set their fastest time in Q2 on that tire and therefore be able to use it at the start of the race. Hamilton did a 1:19.137 and Rosberg a 1:19.761. The Red Bull boys, however, were on the super softs. Verstappen went to the top with a 1:18.972 and Ricciardo fourth with a 1:19.553. At the cut line, Alonso was tenth, Bottas 11th and Hulkenberg ninth. Everybody but Raikkonen was in the pits with four minutes to go. But soon the drivers started filtering out for the last attempts. The top four - Verstappen, Hamilton, Vettel and Ricciardo - stayed in the garages. Hulkenberg and Bottas moved into the top 10. The six drivers who ended up being eliminated at the end of FP2 were: Alonso, Perez, Button, Magnussen, Ericsson and Wehrlein. The fastest 10 drivers who moved on to Q3 were: Verstappen, Hamilton, Vettel, Ricciardo, Rosberg, Hulkenberg, Raikkonen, Bottas, Massa and Sainz. So the Mercedes and Ferrari drivers would start the race on the medium compound Pirellis and the Red Bull guys on the super softs. Rosberg won the pole last year with a time of 1:19.480, but he had been slightly off the pace in the sessions so far this year. Q3 lasted 12 minutes, and all 10 drivers were soon on track. The first to set a time was Hulkenberg who clocked a 1:30.850. Verstappen then put in a 1:19.092. Everybody was on the super soft Pirellis. Hamilton then took the top spot with a 1:18.704. Ricciardo was third with a 1"19.201 and Rosberg fourth with a 1:19.263. Hulkenberg, Raikkonen, Bottas, Vettel, Massa and Sainz rounded out the top 10. There was time, of course, for all of them to make another dash on the super softs. Ricciardo was the first to have a go, and he clocked a 1:19.133. Verstappen did a 1:19.054. Hamilton was fractionally slower with a 1:18.710. But here came Rosberg, finally fast, with a 1:18.958 to move up to second place. The top 10 qualifiers were: Hamilton, Rosberg, Verstappen, Ricciardo, Hulkenberg, Raikkonen, Vettel, Bottas, Massa and Sainz.